Our range of Digital Angle Gage/Inclinometer and Protractors are suitable for a variety of applications such as measuring and setting angles. We have all sorts of sizes for products like the Digital Level Professional Range with Audio, Digital Angle Ruler Readout Gage and more. The new model WR300BT is the same best-selling WR300 Type 2 but with Bluetooth to communicate with your smartphone. A digital protractor with 750mm arm and body, the extra length makes this angle finder ideal for measuring, marking, and setting angles. A digital protractor with 450mm arm and body, the extra length makes this angle finder ideal for measuring, marking, and setting angles. Professional 1200mm Digital Level with large LCD display and audio. Rotary Angle Encoder and Remote Display, with a 6mm Diameter Shaft. Rotary Angle Encoder and a Remote Display with a resolution of 0.1 degrees. 6mm diameter shaft. 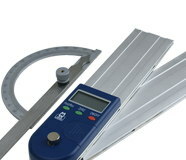 Digital angle protractor with large LCD display. 0.05 degree resolution.